Yes, the new PHP elePHPant with 2019 design is available now and it is very beautiful. After many months of wait, you can order it now. With the approval of Vincent Pointier, the creator of the original design, we have produced a prototype that he liked and is faithful to his design. Read this article to see how the elePHPant looks and how you can be the first to order it now before it gets sold out again. As you may remember, in July 2018 we announced the development of the project to start selling PHP elePHPants for all PHP developers that want them. As expected, the process was very hard and the challenges did not end. At the moment that this article is being written we have started to take orders that will still need to be fullfilled. The good news is that we had a very huge demand for these cute elePHPants from practically anywhere around the world. So there is no time to lose. Let me tell you what we have so far so you can see that all the effort was worth it. We will try to ship the first orders in January. The sooner you order, the sooner you will get your elePHPant. We had the interest of over 1700 units so far and it keeps growing everyday. So we will serve first those that order the elePHPant now. So, go ahead and place your order so your elePHPant arrives soon. Access the shopping page. You need to have an account in the PHP Classes site and be logged in. 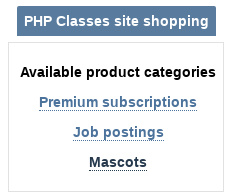 Then you need to go to the PHP Classes site shopping page and enter in the section for the mascots category. 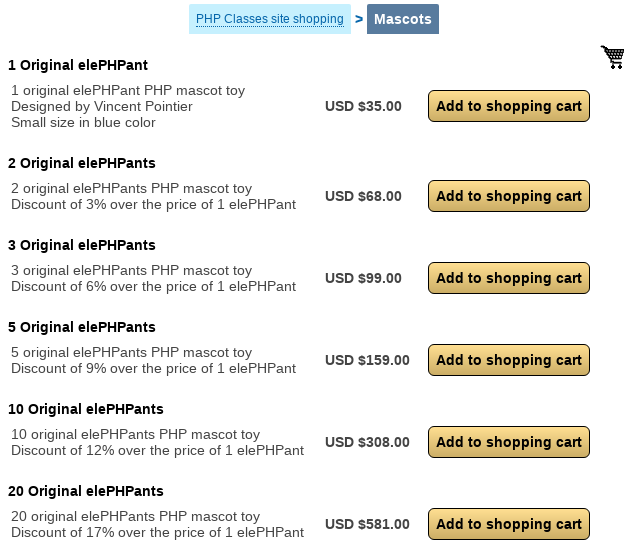 Add the elePHPant to your shopping cart in the quantity you want. You can order more than 1 elePHPant at once, probably to also buy for your colleagues, spouse, kids or other people that you care. 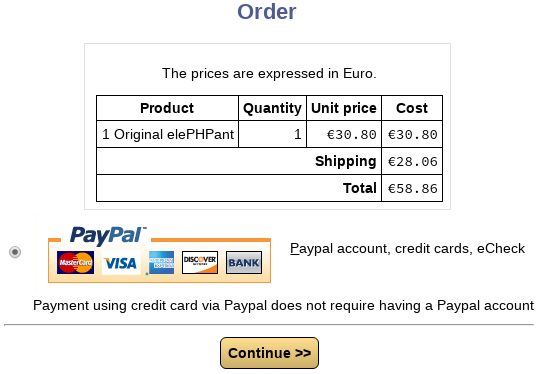 The more elePHPants you order, the greater can be the discount that you get for ordering in quantity. 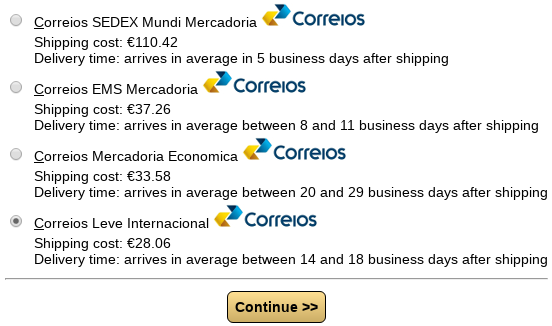 The shipping costs will be less expensive because they can be divided by all the people tho whom you order elePHPants. For instance, instead of each of you buy one elePHPant each, you can place an order for maybe a box of 10 or 20 elePHPant units with 17% of discount. Then you can click on the "Checkout and Pay" button. A summary of the order will appear. The shipping and total amounts will not appear yet because they depend on the delivery and billing addresses that you need to specify on the next screen. 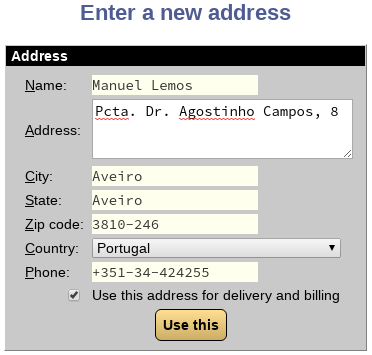 Enter a new address that can be used for both the delivery and the billing. In that case tick on the checkbox below the address fields to tell the site to use the same address for delivery and billing. Select one of the available shipping methods depending on the urgency and the budget you have for paying the order. The shipping costs will appear in a currency that usually is the currency used in your country from the available currencies supported by the site. Currently the site supports paying for the other either in United States Dollars, Euros, and Brazilian Real. Other currencies may also be supported in the future. Then select the payment method after you check the order again, this time with the final shipping costs and total amounts expressed in the currency of the country that you selected for the billing address. Currently the site supports payments via Paypal. It allows you to pay using a credit card you have and have added to your Paypal account. Paypal is a very secure method that we use since 2006 for accepting payments of several services provided by the PHP Classes site. Our site does not have access to any details of your credit card because the payment happens on Paypal site. 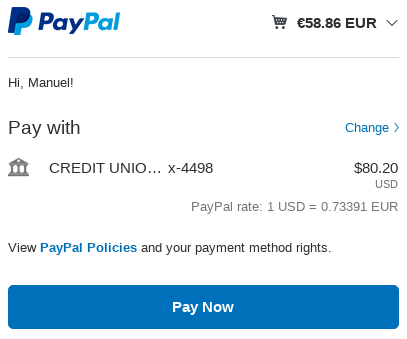 Next you need to move on to the payment page in the Paypal site. If you need an invoice you can click on a button that says "View this order invoice". That will open a separate page with your order invoice details. You can save or print the invoice, in case you need to justify the expense of the order to your company financial department or for some other reason. 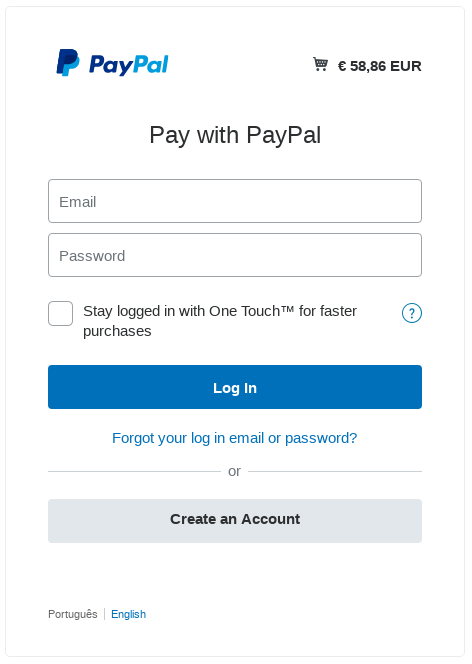 Then you can pay at Paypal using either a new account that you can create quickly or an existing account if you already have one. Once you have logged in your Paypal account you can select a payment method that can be a credit card you added to your account or an amount you have in your account balance eventually in a different currency. After you are done with the payment, a success message should appear and the browser should be redirected back to the PHP Classes site. 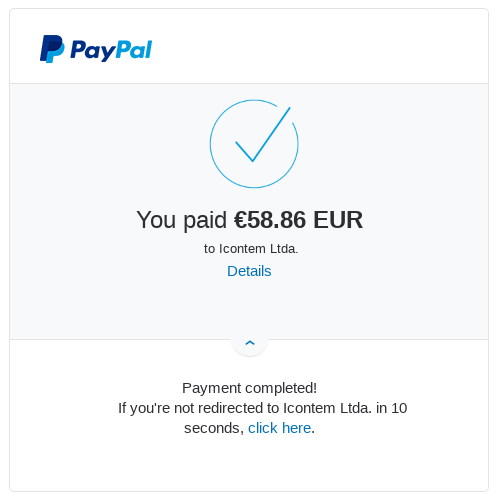 After this you should receive an email with the confirmation that the payment was received. The message also contains an estimate of when the elePHPant order will be shipped to you. After shipping you will receive another email with the tracking information so you can look at a post office site where is order until it reaches your local post office to be delivered to your address. The process of producing and selling physical products like an elePHPant is hard. It takes a lot of time and dedication to make it happen. This is probably why it is very hard to find these elePHPants for sale. Since we just started to sell the elePHPants, it is possible that you may encounter some issues that need to be fixed so all goes well for you that want to buy an elePHPant. If you find any issues, you can help fixing the problems quickly by telling us by email info@phpclasses.org or by accessing the PHP Classes site page on Facebook and click on the button to send us a message. There is a way that we can provide to reduce the costs and speed up the orders if you participate in a local PHP user group. You just need together with some of your PHP user group developers and place a greater order. We will give priority to customers that place larger orders. Also, if you make part of an organization of a PHP event, we can also sell elePHPants to your organization at a lower price as long as you order a good quantity eventually to sell to the developers that attend to your event. In any case you can place an order for more elePHPants in the same page that you can place an order just for 1 elePHPant here. If you need a larger number of elePHPants, you can place multiple orders of the largest pack that is available. If you need to make a special order in a much larger quantity you can contact us by email sending a message to info@phpclasses.org. Another way to reduce the cost of purchasing the elePHPants is that we ship them in a good quantity to a distributor in your country, so we can reduce the costs of shipping per unit. If your company is interested to become a distributor of these elePHPants, please contact us by email info@phpclasses.org so we can make the necessary arrangements and you can act as a distributor. The original elePHPant is blue and only has one logo of PHP in its body. You can also order customized versions in different colors and eventually using additional logo, for instance of your local user group or of your company. We can produce these customized versions too but they need to be ordered separately because we need to build a prototype that matches your interests. Then we need to negotiate a minimum order that the factory is willing to produce. 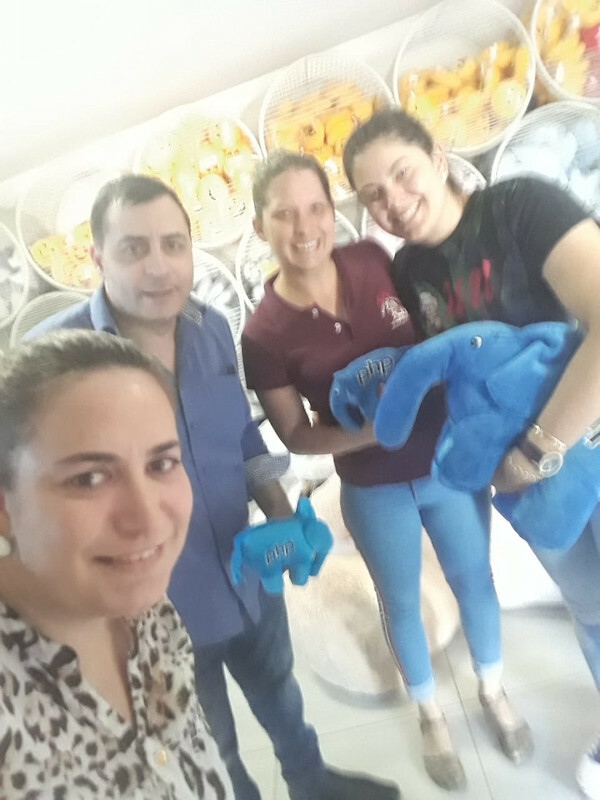 If you are interested in buying a batch of customized elePHPants, please contact us by email info@phpclasses.org so we can move on and produce your own version. Developing and producing elePHPants was certainly not done just by one person that would be me. I am just one of millions of PHP developers that writes PHP code to provide services to many others, just like you that is reading this article. Besides me there are several other people that are important and contributed to make this possible. I would like to start with my wife Glaucia Felisbino and thank her for all the support and encouragement. 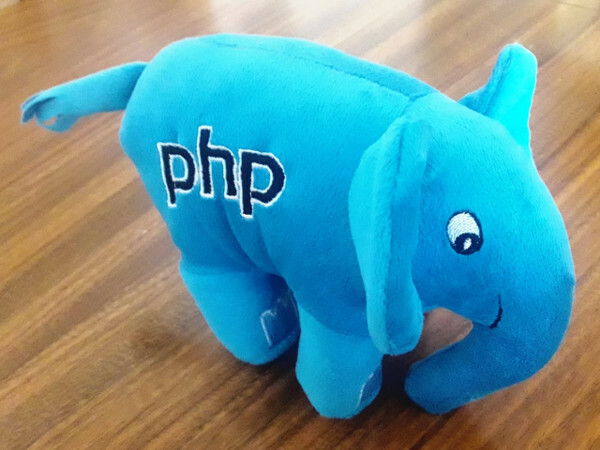 I also would like to thank Daiane and other people from the factory that developed and produced the elePHPant version 2019, as well the elePHPants that the PHP Classes site gives to PHP Innovation Award nominees since 2016. You can see Daiane and her colleague with my wife Glaucia in the picture below. I also would like to thank Junior Grossi, a long time awarded contributor of the PHP Classes site, for being the first customer to order and receive this version of the elePHPant. I also would like to thank to the more than 600 PHP developers that expressed interest in buying elePHPants in the last months. Finally, I would like to thank Vincent Pointier that created the original elePHPant and had the time and the patience to help us by authorizing to produce elePHPants and approving the prototype that we are finally selling. 1,523,654 PHP developers registered to the PHP Classes site.